KAILUA-KONA, Hawaii (AP) — Coral reefs off the Big Island are stabilizing nearly four years after Hawaii's worst bleaching event, an environmental organization said. KEY LARGO, Fla. (AP) — Over 400 marine scientists and specialists have gathered in the Florida Keys to compare notes and examine solutions to preserve coral reefs around the world. Reef Futures 2018 began Monday at the Ocean Reef Club. Organizers say the coral restoration and intervention-science symposium will run through Friday. NEW YORK (AP) — It's the color of underwater reefs hanging on for dear life. The sky at dusk. Some of the latest iPhones and the latest looks on the runways of Marc Jacobs and other top fashion designers. Living Coral has been chosen by the Pantone Color Institute as its 2019 color of the year. WELLINGTON, New Zealand (AP) — In an attempt to protect the coral reefs that divers so admire they have dubbed them the underwater Serengeti, the Pacific nation of Palau will soon ban many types of sunscreen. HONOLULU (AP) — Pioneering coral reef scientist Ruth Gates, who dedicated much of her career to saving the world's fragile and deteriorating underwater reef ecosystems, has died. She was 56. Gates died in Honolulu on Thursday, the University of Hawaii said Tuesday. The researcher, also the president of the International Society for Reef Studies, was diagnosed with brain cancer in May and had been on medical leave since. KAILUA-KONA, Hawaii (AP) — A species of coral that environmentalists say is at risk from climate change could need U.S. protections across its entire range — not just in Hawaii, federal officials have found. MIAMI BEACH, Fla. (AP) — A year after Will and Daniel Payne lost their mom, and nearly two decades since their father's death, it was time to follow their wishes for the afterlife. MAYA BAY, Thailand (AP) — Once a pristine Thai paradise, the secluded bay made famous by the Leonardo DiCaprio movie "The Beach" has been exhausted by mass tourism. Now it's getting a break. After Friday, the daily influx of dozens of boats and thousands of visitors unsuccessfully scrambling for an unspoiled view of Maya Bay's emerald waters and glistening white sand will end. The attraction is being closed for four months to give its coral reefs and sea life a chance to recover. LOOE KEY, Fla. (AP) — A mysterious disease hammering Florida's dwindling reefs was found for the first time this week in the Lower Keys, alarming scientists who've used epoxy adhesive bandages, amputated sick coral and even set up underwater "fire breaks" in a four-year battle to contain the outbreak. HONOLULU (AP) — Many sunscreen makers could soon be forced to change their formulas or be banned from selling the lotions in Hawaii. State lawmakers passed a measure this week that would ban the sale of sunscreens containing oxybenzone and octinoxate by 2021 in an effort to protect coral reefs. Scientists have found the two substances can be toxic to coral, which are a vital part of the ocean ecosystem and a popular draw for tourists. State Park officials released the name of the teenage boy who died Thursday in an accident at Coral Pink Sand Dunes State Park. Colton R. Hansen, a 13-year-old from Eagle Mountain, was riding his four-wheeler with friends and family at the time of the accident. Colton went over a dune about 5 p.m. Thursday, and tumbled down the other side multiple times, sustaining fatal injuries. A 13-year-old Utah County boy was killed Thursday at the Coral Pink Sand Dunes State Park in Kane County. At about 5 p.m. Thursday, the boy was riding a four-wheeler with friends and family when he went over a dune and tumbled down the other side multiple times, "sustaining fatal injuries," according to a press release from Utah State Parks. Turtles have taken over the hallways at Wood Gormley Elementary School. And in the lobby, a variety of fish, clams, lobsters, sea horses and sponges fill a reef scene dominated by corals — sessile creatures that take root on the ocean floor. While the colorful, Meow Wolf-inspired immersive arts project is meant to entertain, the exhibition also draws attention to the challenges facing the world’s coral reefs as they struggle to survive in an era of global warming. BRISBANE, Australia (AP) — A helicopter carrying American tourists crashed at a coral-viewing site on Australia's Great Barrier Reef, killing two passengers from Hawaii and injuring two others from Colorado, police said. BEAU VALLON, Seychelles (AP) — Beneath the crystal-clear waters of the Indian Ocean island nation of the Seychelles, a fight is growing to save the coral reefs that shelter a range of creatures, from tiny invertebrates to the sprawling octopus, from climate change. The fragile reefs act both as a protective barrier for coastlines and an attraction for the tourists who keep the country's economy going. But the reefs are also one of the first victims of rising ocean temperatures. FAJARDO, Puerto Rico (AP) — As crews re-string electric lines and clear debris from Hurricane Maria, a small group of Puerto Rican and international conservationists is working on rebuilding natural wonders destroyed by the strongest storm to hit the island in nearly a century. PORTLAND, Maine (AP) — Federal fishing regulators on Tuesday approved a compromise they said would expand the amount of coral habitat preserved in the Atlantic Ocean while also protecting fishing interests. PORTLAND, Maine (AP) — A federal panel is revisiting a proposal to offer new protections to deep-sea corals in the Atlantic Ocean. The New England Fishery Management Council has been working on coral protections in the waters off New England for several years. The council approved protections in the Gulf of Maine in June, but held off on voting on protections for an area south of Georges Bank so it could get more information. CANBERRA, Australia (AP) — Australia experienced its third hottest year on record in 2017, when surrounding high sea temperatures delivered a second consecutive summer of devastating coral bleaching on the Great Barrier Reef, officials said on Wednesday. Much of the World heritage-listed Great Barrier Reef off Australia's northeast coast has been left a white graveyard due to unusually high ocean temperatures causing mass bleaching of coral expanses in 1998, 2002, 2016 and 2017. WASHINGTON (AP) — Global warming is making the world's oceans sicker, depleting them of oxygen and harming delicate coral reefs more often, two studies show. The lower oxygen levels are making marine life far more vulnerable, the researchers said. Oxygen is crucial for nearly all life in the oceans, except for a few microbes. 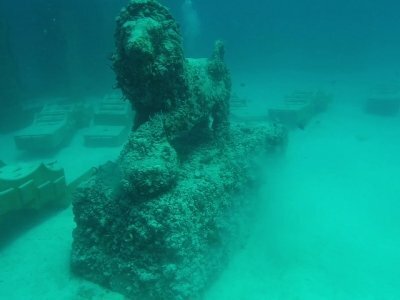 MIAMI (AP) — A mysterious epidemic continues to sweep South Florida's reefs, transforming corals into lifeless skeletons and threatening undersea structures that support tourism, provide hurricane protection and serve as homes to a vast range of marine life. The U.S. Geological Survey study found pollution is not only eroding the reef, but is also inhibiting new coral growth, the Honolulu Star-Advertiser reported . HONOLULU (AP) — Nearly half of Hawaii's coral reefs were bleached during heat waves in 2014 and 2015 and fisheries close to shore are declining, a group of scientists told state lawmakers. The scientists from the Nature Conservancy briefed the lawmakers on Thursday about what they called an unprecedented situation for Hawaii's sea life. BOSTON (AP) — An Australian citizen who masterminded a scheme to smuggle items made of rhinoceros horn, elephant ivory and coral to China pleaded guilty Tuesday in a U.S. court. Guan Zong Chen, who also goes by Graham Chen, and two co-defendants smuggled $700,000 worth of carvings in violation of federal law and despite the fact that their export was barred under a 1976 international treaty meant to protect endangered species, federal prosecutors said. HONOLULU — Updates on activities within the Papahanaomokuakea Marine National Monument will be presented at a public meeting on Oct. 12 in Honolulu. The Reserve Advisory Council for the National Oceanic and Atmospheric Administration’s Northwest Hawaiian Islands Coral Reef Ecosystem Reserve will be receiving and discussing updates, activities and agency actions at the meeting. HANALEI — Black band disease is once again spreading through some corals around Kauai, according to Hanalei researcher Terry Lilley. Over the past two months, Lilley surveyed the same 20 sites that he monitored in 2013 and 2014 with researchers from University of Hawaii, U.S. Geological Survey, and the National Oceanic and Atmospheric Administration. HONOLULU — Sen. Mazie K. Hirono announced that the National Oceanic and Atmospheric Administration has awarded $646,886 in grant funding to restore the Kawaihae watershed in West Hawaii. Kawaihae is considered to be one of the state’s most degraded watersheds. GREENWICH — Henry Hittle turned 18 in Belize this summer while fulfilling requirements for his Master Scuba Diver certification. The Stanwich School soon-to-be senior began working toward his certifications three years ago after an influential eighth-grade trip with the school to Key Largo, and now wants to keep climbing the ladder. WAILUKU, Hawaii (AP) — The reef at Olowalu is the largest and best developed on Maui, and it is a spawning ground that has helped populate reefs around the Hawaiian islands. But decades of runoff and recent coral bleaching events have taken their toll on the sprawling marine hub. The Olowalu reef was designated Thursday as a Mission Blue Hope Spot. The reef is the first in the state to receive the title, The Maui News reports (http://bit.ly/2vlvog6 ). Could research in Keys give coral the 2nd chance it needs? KEY WEST, Fla. (AP) — A strange scene plays out in the depths below the clear azure water of Key West's Fort Zachary Taylor Historic State Park on a recent morning, one that doesn't quite fit with the serene ambiance of the area. WOODS HOLE, Mass. (AP) — A troubling documentary about the fate of the world's coral reefs is opening this weekend's Woods Hole Film Festival. The acclaimed film "Chasing Coral" follows a team of divers, photographers and scientists trying to discover why coral reefs are vanishing at an unprecedented rate. BOSTON (AP) — A Chinese national has been arraigned in federal court in Boston on charges he led a conspiracy to illegally smuggle $700,000 worth of goods made from banned rhinoceros horn, elephant ivory and coral. Guan Zong Chen was arrested last year while traveling from China to Australia, which extradited him to the U.S. on a 2015 indictment. He pleaded not guilty Monday. LIHUE, Hawaii (AP) — Those who study Hawaii's coral reefs are hoping a recent $715,000 federal grant awarded to the state of Hawaii will amp up both the education and conservation of the underwater ecosystems. The National Oceanic and Atmospheric Administration awarded the grant to the state of Hawaii as part of a cooperative agreement between the organization and Hawaii's Division of Aquatic Resources, U.S. Sen. Mazie Hirono of announced Thursday. LIHUE — Education and conservation are priorities for those who study Kauai’s coral reefs, and they’re hoping a recent $715,000 federal grant awarded to the state will amp up both. The National Oceanic and Atmospheric Administration awarded the grant to the state of Hawaii as part of a cooperative agreement between NOAA and Hawaii’s Division of Aquatic Resources, according to a Thursday announcement from Sen. Mazie Hirono (D-Hawaii). KEY LARGO, Fla. (AP) — Astronauts are helping coral grow on the ocean floor off Florida. Marine scientists at Florida International University are studying corals growing in deep waters. The Miami-area school reported recruiting NASA astronauts to plant a coral nursery 90 feet (27 meters) below the ocean's surface in the Florida Keys National Marine Sanctuary. HAVANA (AP) — A joint U.S.-Cuban expedition to explore the island's coral reefs uncovered a surprisingly healthy ecosystem and large schools of mackerel with significant commercial value, scientists involved in the mission said Tuesday. The study also found alarmingly high numbers of invasive lionfish, which is not native to the Western Hemisphere and has become a growing marine menace in recent years. Among other things, coral reefs have an image problem: their beauty is hidden under the waves — and so is their destruction from a rapidly warming climate. That’s why in 2014, College of Charleston professor Phil Dustan escorted documentary filmmakers to Carysfort Reef in the Florida Keys.